One of the less-collected T-series releases, the 1911 T208 Fireside Baseball set showcases only the Philadelphia Athletics and is not in great supply. While the minimal options and overall rarity keep it from having a larger amount of hobby interest, the T208 cards maintain strong values. 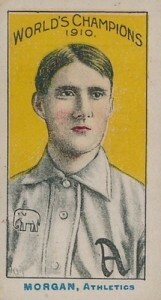 1911 T208 Fireside Baseball cards were inserted individually inside packages of Cullivan's Fireside scrap tobacco. The Thomas Cullivan Company was a small tobacco business in Syracuse, New York. It's likely the distribution didn't reach far beyond the city as T208 cards are among the scarcest of all the mainstream T-series cards. The fact that Jefferson Burdick (author of the American Card Catalog) grew up in Syracuse and was a child at that time probably accounts for the reason the cards were catalogued in the first place. Featuring only 18 cards, the 1911 T208 Fireside Baseball set commemorates the 1910 World Series champion Philadelphia Athletics. 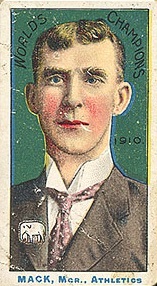 Every card covers a member of that title team, including most of the key players and manager Connie Mack. In all, T208 features five Hall of Fame players. T208 cards measure the same size as most tobacco cards of the time (1-1/2" by 2-5/8") and include a similar design the the vaunted T206s with a white border around the card. However, there are several key differences. 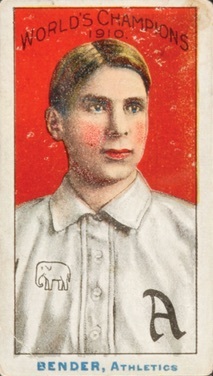 The words "World's Champions 1910" appear above each player and the outline of an elephant can be seen on each player's jersey. Also, the ink used for the last name and Athletics team name is blue. 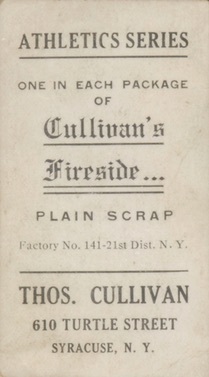 Card backs feature an advertisement for Cullivan's Fireside tobacco, with Athletics Series printed above it. At the bottom is the Syracuse street address for Cullivan's factory. 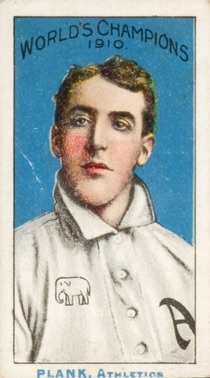 Although the T208 cards are scarce, the images may look familiar as the pictures and players from the 1911 T208 Fireside Baseball set are also used in both the E104-1 and D359 Williams Baking cards. These cards aren't nearly as tough to track down as Fireside cards but can cause some confusion with newer collectors. However, each set can be properly identified by the advertising on card backs. 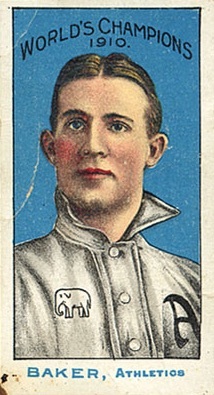 While there are not any known variations, one of the 1911 T208 Fireside Baseball cards long thought to feature Cy Morgan is now believed to be a case of mistaken identity. 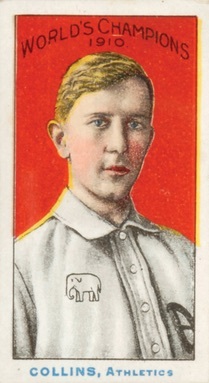 Instead of featuring Morgan, the image reportedly showcases Benny Bowcock and was uncovered by SABR in the July 2013 issue of their newsletter Reflecting The Past. This is especially surprising since Bowcock's only MLB experience was 14 games with the St. Louis Browns in 1903 and he was actually in the minors when the Athletics won the title. Topsy Hartsel T208 1911 Cullivan's Fireside World's Champions SGC A Rare of 3! 18 cards. Shop for base cards on eBay. What’s with these early cards with embellishing the cheeks in red? Is that just the artistic style of the early 1900s? I know the Victorian style would use a LITTLE bit of blush, mostly for women, but not to this extreme, and certainly not for men. As a collector myself, I’ve always hated this, and was one of the reasons why I avoided early 20th century baseball cards. Forgot to rate it. I don’t like these products, but I understand their importance in card collecting. Not my cup of tea.